Excited and nervous to share with you guys some pictures and details about my engagement ring! It's like introducing your child into the world, I hope you love it as much as I do. When Andrew and I first started talking about the possibility of getting engaged I told him that I wanted to be able to pick out my own engagement ring. It may seem taboo to do so, but if this was something I would look at every day for the rest of my life, I wanted to make 100% sure I loved it. It needed to be me, and it needed to be something we did together. I gave Andrew the option to either surprise me with something else (I suggested a new monogram necklace I always wear) or go ring shopping together and have it be a surprise from there. He obviously chose the latter. Once we were ready, we set a date to go ring shopping in the city. To back up a little bit, for a good part of my life I wanted a solitaire round diamond on a gold band and that was it. That was going to be my engagement ring. I decided on it in high school and it remained that way until about two years ago. I'm not totally sure what changed my mind, but something was in the pit of my stomach. It would look like everyone else's ring. Back to about two years ago I started looking at other options for what I wanted in an engagement ring. I was all over Pinterest, trying on all my friends' rings, searching on Instagram -- the whole shebang. And the more I looked the more confused I was. There were so many options. How do you commit to wearing one thing for the rest of your life? What if you choose something that is trendy but not truly you? 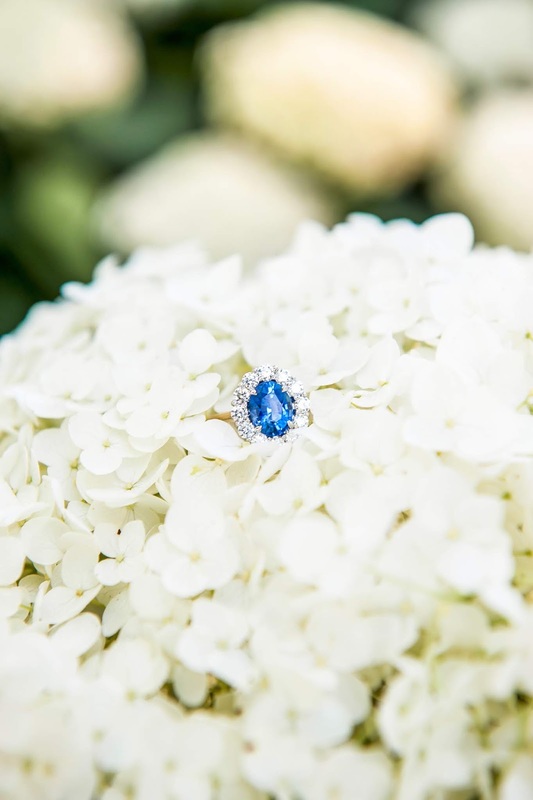 I have always loved sapphires but the thought of a non-diamond engagement ring kind of scared me. But out of all the photos I saved, half had the same blue sapphire center. I couldn't get it out of my head. 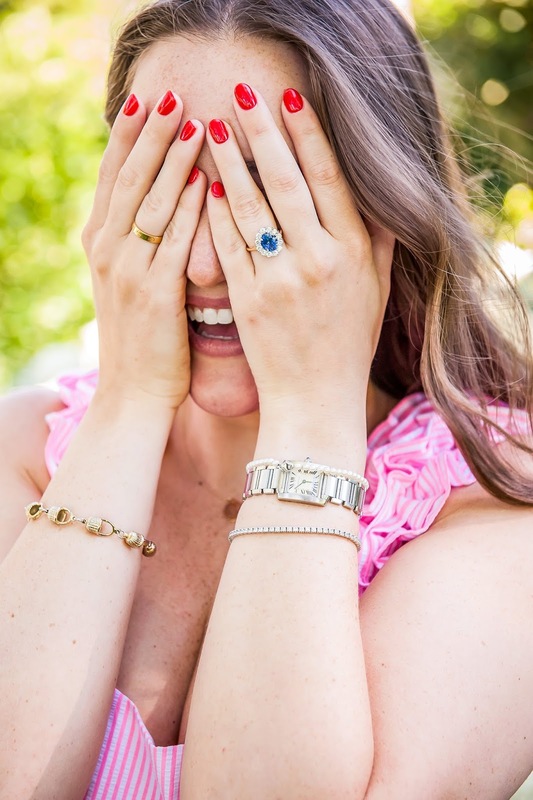 I was also in love with Sarah and Rosie's colored rings, so I thought I would give it a go when shopping for my own! I also randomly came across this video on Instagram and kind of fell in love with it. It spoke to me. From there I was on a mission to find that ring but in sapphire form. I searched every hashtag imaginable, Google image searched ... I did everything but couldn't find *the one*. 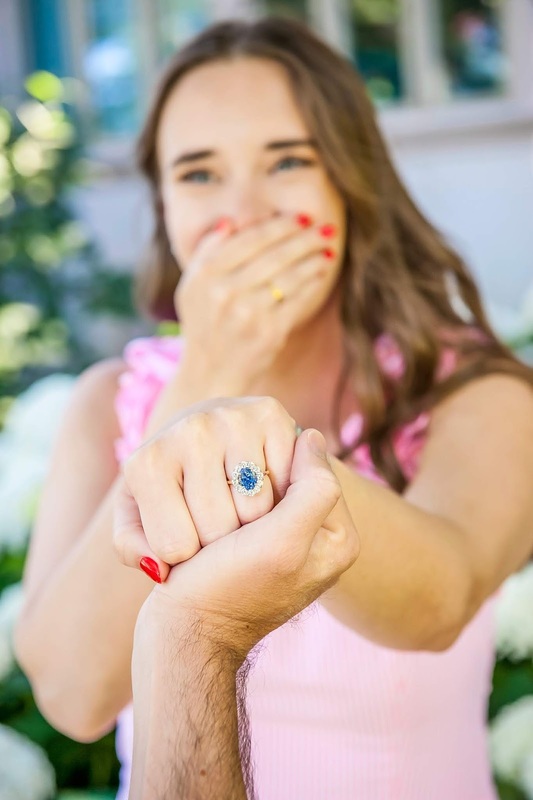 A lot of people have been comparing my ring to Princess Diana's ring, and -- yes -- it is inspired by hers but totally different (once you see more of it!). Here is the kicker: I didn't want a flower/spiky look. I wanted it scalloped, meaning I wanted the diamonds to lead the shape on the outside versus having the prongs on the outside of the ring. Trying to find that was nearly impossible! By the time we finally made it to the store I was pretty sure of what I wanted. It was still hard to move forward since I really wouldn't be able to see the ring I imagined until it was finished and on my finger. The fear of the unknown was pretty scary. In the end it really was all worth it. It turned out more beautiful than I could have imagined, and every day I look at it my heart is filled with love and joy. Outside of my stuffed animal dog, it is my favorite possession. I don't know if there could be a more "me" ring out there and I'm really pleased with how it turned out. I don't regret a single decision we made in the process. It's truly perfect. I will be sharing the full design process of the ring next week! **Please note that I am not sharing the name of the store, and will not ever do so. While we worked with a wonderful jeweler (who has moved on to another retailer), I have nothing good to say about the store itself and don't want to give them any kind of press -- good or bad. 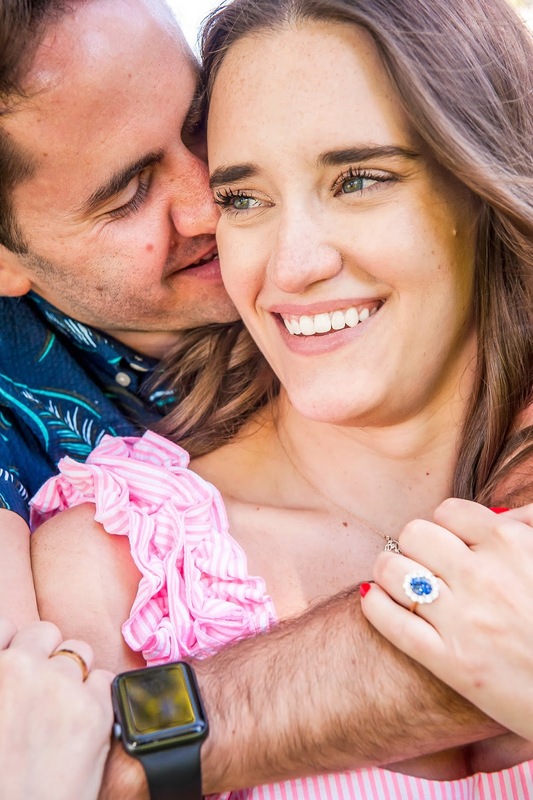 I asked them when we started the process (because of the blog) to not post/promote/share any details of my ring on their social media or site -- which they agreed to. Not only do I not want this ring replicated, I don't want anyone calling to find out how much it cost or any further private details about it or about Andrew (you'd be surprised by how nosy people online are). About two months after the last time I saw the ring (which was a rough metal that I tried on for fit and final edits) I saw the FINISHED product on their Instagram account, and soon after realized they were also selling it online. This was in May. Remember, I didn't get engaged until July. Not only did they go against my desire to not share/sell the ring, they ruined the surprise by posting it! I hand drew this design -- every last etch -- with the jeweler so I knew without a shadow of a doubt that it was my ring. At that point I didn't even know if it was done or if Andrew had picked it up! So I called Andrew crying at work and (God love him) he walked right out of work and into the store, requested they take it down and watched them do it. If you have any questions about the ring or anything else, let me know down below and I will answer them in my next post about the design process! 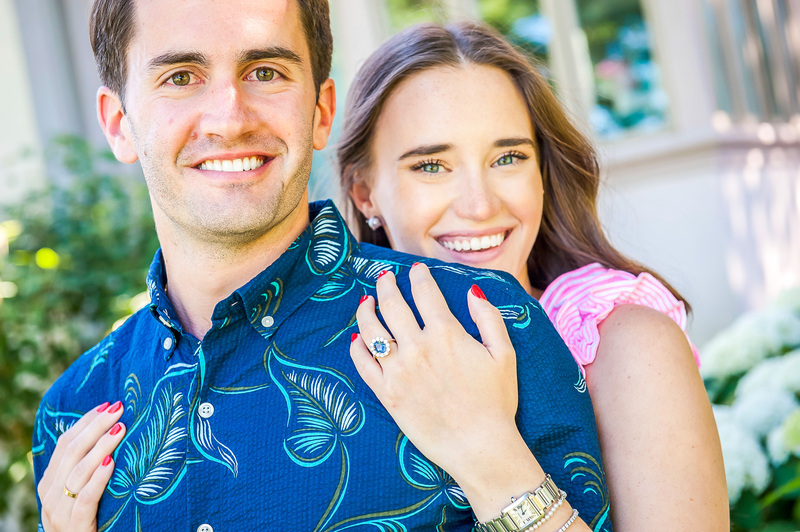 See photos from our engagement HERE! Read about how he proposed (from his side) HERE and how he proposed from my side HERE! And if you want more wedding updates, I just shared my first post HERE!